Three crewmembers from the International Space Station get a view of the orbiting laboratory as they fly back to Earth in their Russian Soyuz space capsule. A Soyuz spacecraft has undocked from the International Space Station and is preparing to descend into Earth's atmosphere to return an American astronaut and two Russian cosmonauts back home after nearly five months living in orbit. The undocking tonight (March 15) occurred smoothly, but one day later than planned, due to freezing rain and fog at the Soyuz's landing site on the steppes of Kazakhstan in Central Asia, which delayed the departure. Returning home on the Soyuz are NASA astronaut Kevin Ford and Russian cosmonauts Oleg Novitskiy and Evgeny Tarelkin. 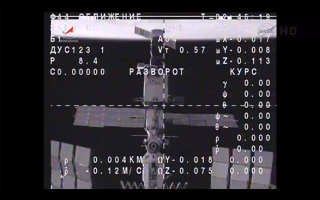 "Okay guys, good luck," Russian cosomonaut Roman Romanenko said as the three spaceflyers pulled away from the station. The U.S.-Russian Soyuz crew is scheduled to land tonight at 11:05 p.m. EDT (0305 GMT March 16), and you can watch it live on SPACE.com courtesy of NASA. The space agency will air a live webcast of the Soyuz's deorbiting and landing beginning at 9:45 p.m. EDT (0245 GMT March 16). It will be early Saturday local time at the Soyuz landing site at the time of touchdown. The three astronauts have spent 142 days on board the space station. This is Ford's second trip to space, but it marks the first trip for both Novitskiy and Tarelkin. Novitskiy, Tarelkin and Ford said their goodbyes to Canadian astronaut Chris Hadfield, NASA astronaut Tom Marshburn and Russian cosmonaut Roman Romanenko — the three astronauts staying on board the International Space Station — before the hatch closed earlier today. The new space station mission — Expedition 35 — officially began when the Soyuz spacecraft undocked from the orbiting laboratory at 7:43 p.m. EDT (2343 GMT). On Wednesday, Ford ceremonially passed the command of the football field sized station onto the newest commander, Hadfield. This marks the first time a Canadian astronaut has led an International Space Station crew. "They showed us how to live in space," Hadfield said of the three astronauts heading back to Earth during the change of command ceremony. If all goes as planned, it will mark the first time a Soyuz capsule has delivered a station crew to the orbiting laboratory in one day. Russia's Federal Space Agency has proven the one-day flight profile during unmanned Progress cargo ship deliveries to the space station.